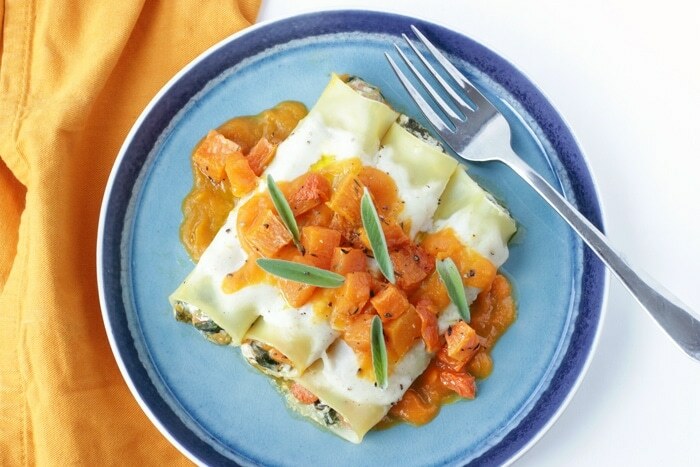 This easy-to-make vegetarian ricotta, spinach and pumpkin cannelloni turns comfort food into a special meal perfect to celebrate fall season. Cannelloni have a big place in my foodie heart. I grew up with the smell of my mum’s cannelloni coming all the way from the kitchen on a typical sicilian sunday. I never attempted to recreate my mum’s version, because it usually takes a whole morning (actually she starts cooking the bolognese sauce the day before) as most of traditional italian dishes. But I still love cannelloni and this pumpkin version is one of the foods I often love cooking on fall season. 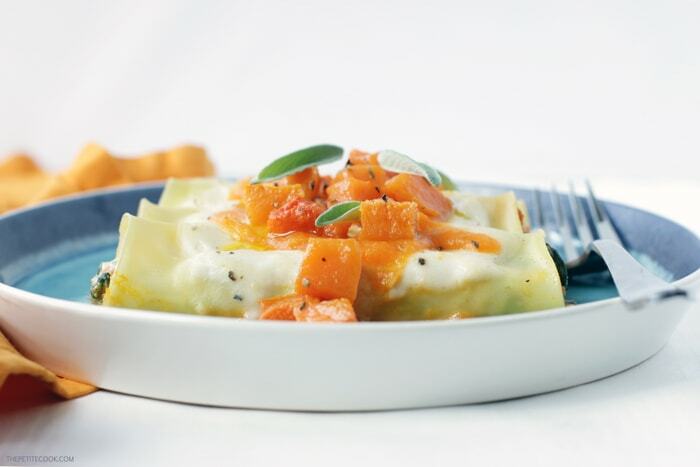 Cannelloni are the perfect shell to hold up any filling you can think of. 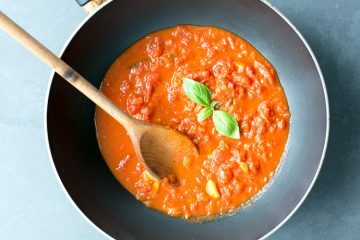 From traditional bolognese sauce, to light tomato and eggplant sauce, you have unlimited filling possibilities. 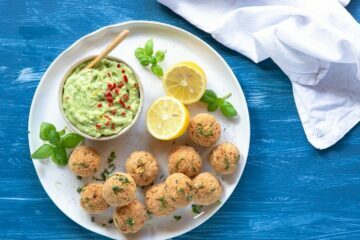 One of my favorite fillings is the ricotta + spinach combo, a classic vegetarian alternative for pasta such as cannelloni, lasagne and ravioli. The nice addition of roasted pumpkin into the ricotta + spinach mix makes this comforting meal fancy enough for a special dinner. 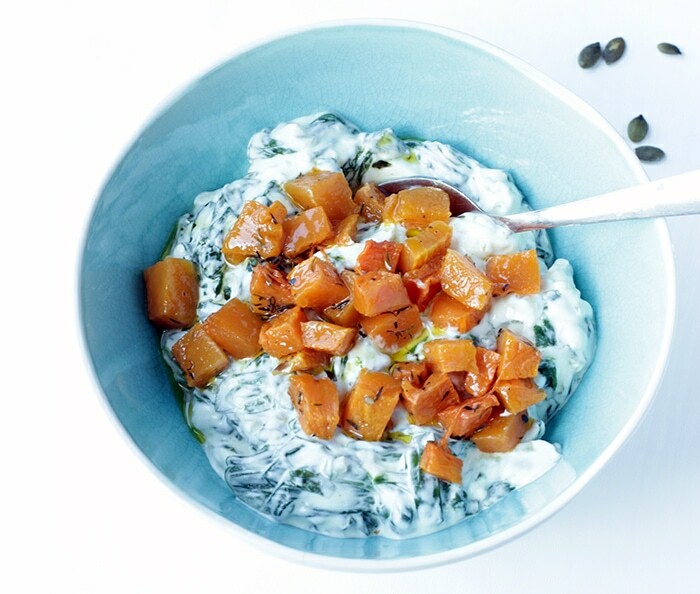 Sweet, aromatic roasted pumpkin combines perfectly well with the delicate ricotta and spinach flavors. 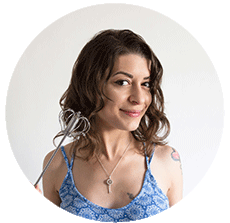 I have also seasoned with a mix of spices such as nutmeg and ginger that traditionally go hand-in-hand with pumpkin. 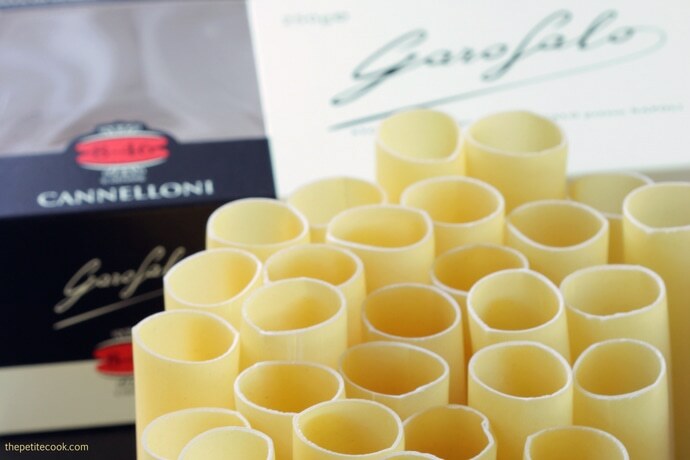 I use Garofalo Cannelloni. As you know already, I’m a big supporter of this italian pasta brand, not only because it was born in the city of Gragnano (the heart of italian pasta), but also for its high-quality ingredients. The pasta has a fantastic texture and flavours and most importantly it stays al dente, even if you miss a minute or two. 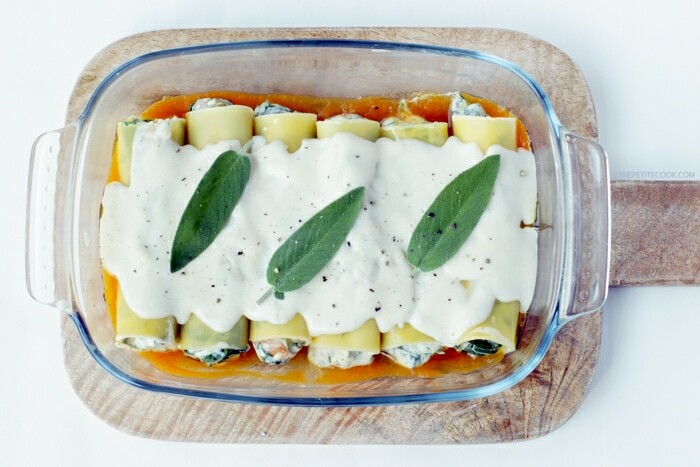 To make this classic cannelloni recipe a lot lighter and healthier, leave out the bechamel sauce and opt for a delicate and quick ricotta white sauce. Simply blend the ricotta with a splash of milk or water. Adjust the consistency by adding more liquid. Season with a little nutmeg, sea salt and white pepper. There you go, a light low-fat and low-cal magic white sauce that is so good (and smart!) you’ll want to use it for any kind of pasta dish. These easy vegetarian pumpkin cannelloni require very simple seasonal ingredients and they’re awfully easy to put together. 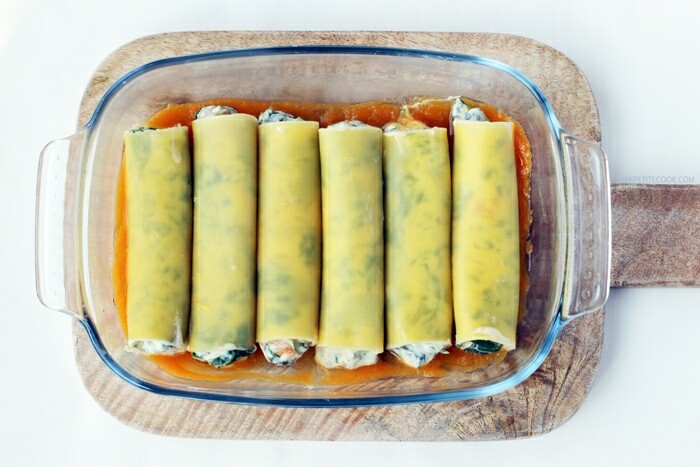 Start by blanching the cannelloni for a minute or two, then fill them up with the mix of ricotta, spinach and half the roasted pumpkin. Make sure to fill the cannelloni well, so it’s not all full of air. Blend the remaining pumpkin to make a puree and use it both for the bottom and top of your cannelloni. Arrange the cannelloni on oven dish (for two people I use a small 9-inch dish that holds up 6-7 tubes) covered with a layer of pumpkin purée. Bake for 10-15 min until the pasta is cooked through and crispy on the edges. Serve piping hot from the oven and indulge into a deliciously homemade meal. Pour extra pumpkin purée on top and pour a layer of ricotta white sauce over the top of your cannelloni. Be sure to leave the edges of the cannelloni slightly uncovered so they get nice and crispy from baking. 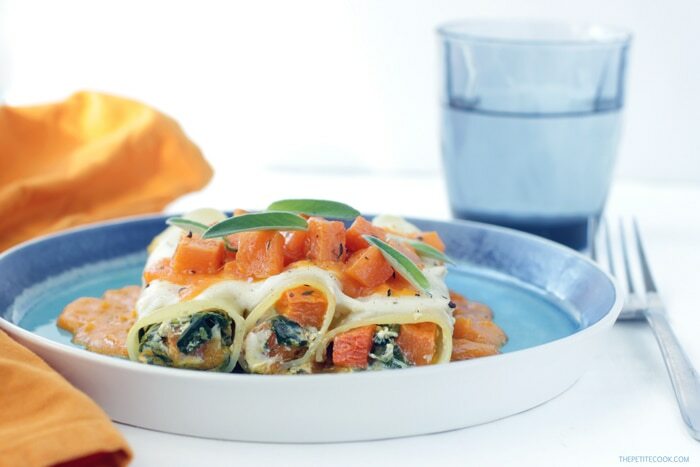 These light ricotta, spinach and pumpkin cannelloni make an awesome, healthier alternative to the traditional italian comfort food. Plus, they’re a great way to sneak into your body some extra fresh seasonal veggies. 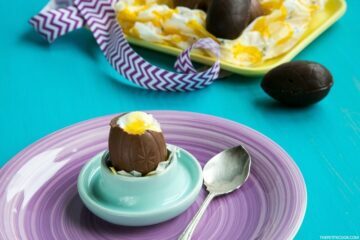 I hope you give this delicious recipe a try! If you do, please leave a comment below and let me know how you liked it! Or even better, take a picture, tag it #thepetitecook and share it on Instagram! Looking at your yummy creations always makes me smile :)! Arrange pumpkin on a baking tray covered with parchment paper. Roast in a preheated oven to 360F/180F for about 30 min or until soft and cooked through. Blanch spinach in a large pot of boiling water, then drain and transfer into a bowl with ice, to cool them down and preserve their bright green color. Transfer into a bowl, add half the roasted pumpkin cubes and the rest of ingredients. Season with salt, pepper and a pinch of nutmeg. Blend the remaining pumpkin to make a smooth puree and set aside. 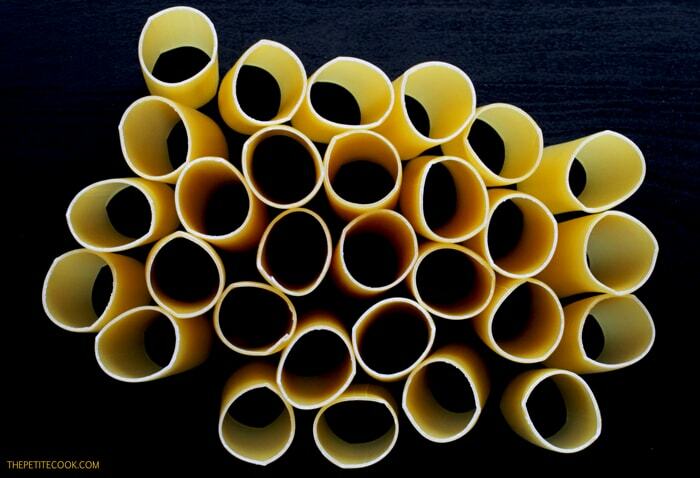 Fold the cannelloni in a large pot of lightly salted boiling water. Cook for about 1-2 min, they should be still hard. Drain and pat dry on a kitchen cloth. Fill a piping bag with the ricotta, pumpkin and spinach mixture. 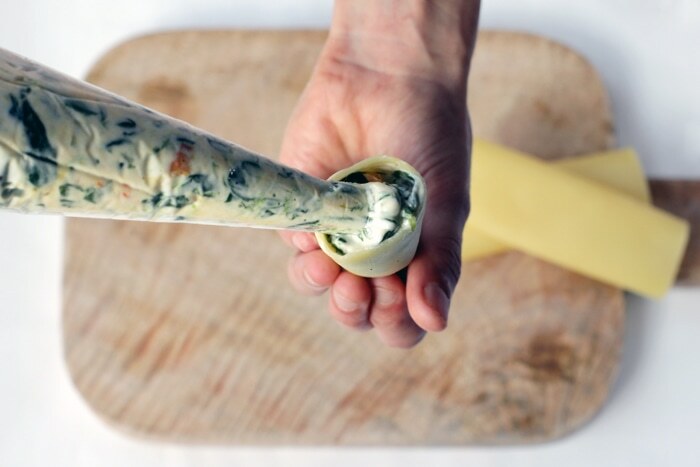 Hold each cannelloni up on your palm to avoid the filling to escape and fill with the prepared mixture. To make the white sauce: simply blend ricotta with a splash of milk/water until it reaches a creamy consistency. Adjust with more liquid if necessary. Season with salt, white pepper, sage and a pinch of nutmeg. 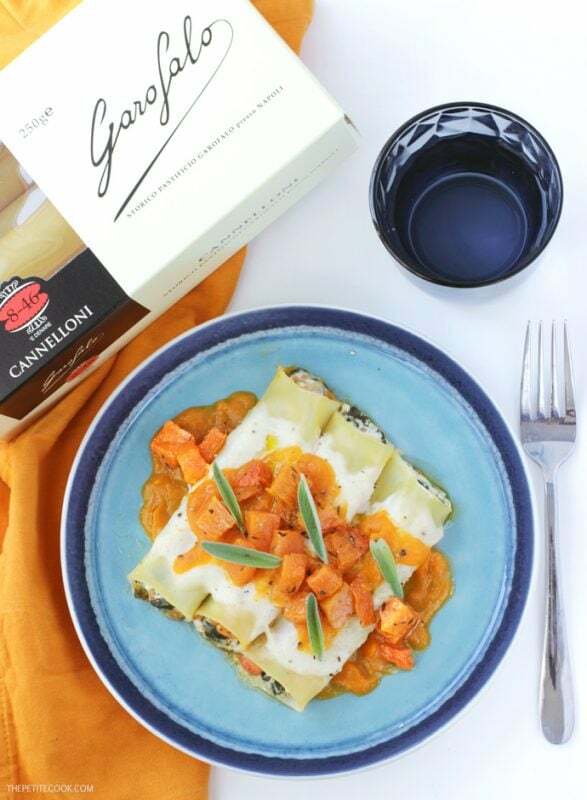 Layer the bottom of a small 9inch baking dish with half the pumpkin puree, and arrange cannelloni on top. Pour over the remaining pumpkin puree and top with white sauce. Season with salt and pepper and bake in the oven to 360F/180F for 15-20 min, until the pasta is cooked through and the edges are slightly crispy.